MPO "Micky" Blake hailed from Bangalore in present day Karnataka. He was born 20 Mar 1923 and was commissioned (IND/2630) at the age of 20 in the Indian Air Force on 27 Sep 1943. Blake served with No.42 Squadron RAF and No. 3 Squadron IAF during the Second World War. Recently, Gp Capt Kapil Bhargava got Gp Capt Blake to pen down some of his memorable experiences from the Second World War. Presented here in the own words of Gp Capt Micky Blake is the story of one of his 'unforgettable' sorties. This is the second part of the recollections of Gp Capt CGI Philip. The first part covers his IAF training, and his first tour of ops with No 8 Squadron on Vultee Vengeances. This part will cover his second tour with the same squadron, flying Spitfires. As before, Gp Capt Philip's words, we believe, convey a unique sense of those unique times, and we have retained them for much of this article. In this article, the author, Col Bhatia tells the family background and story of Gp Capt Karori Lal Bhatia, who led No.12 Squadron during the 1947-48 War, and was the first pilot to land at Srinagar in Kashmir during the airlift of troops into Srinagar. VSC Bonarjee was born in Calcutta on the 27th January 1917. He was the third child and only son in a Bengali Christian family. After graduation, He was commissioned in the Indian Air Force in 1940 in the 4th Course as an Observer (IND/1623) and saw action in Burma. He obtained his release as a Wing Commander to join the Indian Administrative Service in 1948. He retired from the I.A.S in 1975, worked for two international organizations till 1989 and lived with his family at Kalyani near Calcutta. In 1997, his friends convinced him to write down his memoirs which were published in the form of a book by Dr Arabinda Dey. He passed away in 2001. The Account on this page is derived from that book - with the kind permission of Dr. Vernon Bonarjee, his son. In the winter of 1980-81, Wg Cdr Joseph Thomas, CO of 106 Squadron took a detachment to Tezpur where his friend, Wg Cdr Manjit Singh Sekhon was commanding 8 Squadron. 8 SQuadron was preparing for its colour presentation and were updating their archival material. 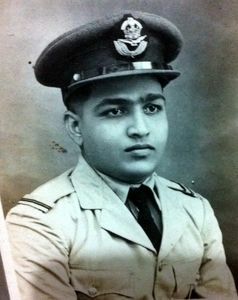 When Wg Cdr Thomas mentioned that his father, Sqn Ldr T J Thomas (Retd) had served in 8 squadron from the time of its formation through service in the Burma front and till they moved to Quetta, Manjit Sekhon immediately wanted Sqn Ldr T J Thomas to write about his experiences in 8 Squadron. Sqn Ldr Thomas was then 66 years old and he put pen to paper to record his memoirs from WW2. The result was sent to 8 Squadron who made a typescript and incorporated it in their history folder. The account is now reproduced on this page, courtesy of Wg Cdr Joseph Thomas, who retains the original manuscript. The memoirs offer a rare insight into the life of an airman during those tumultuous times. It offers a view into the difficult circumstances under which the ground crews operated. We concentrate too often on officers memoirs, and in the process miss out on potential contributions from other ranks. This article goes a small way into changing that. AVM S N Goyal 1560 GD(P) was the seventeenth Indian Officer to be trained in Cranwell. After serving with No.1 Squadron in his early years, he was the tenth in seniority among the IAF Officers at the outbreak of the war. He commanded No.1 Squadron briefly in 1943. AVM Goyal is a recipient of the MBE. Alfred Anthony joined up to serve in the Indian Air Force at the height of World War Two. He was part of the 21st Pilots Course that commenced its training at Initial Training Wing, Poona in July 1943. After completing the initial training Alfred arrived at the No.1 Elementary Flying Training School at Begumpet on 31 October 1943. Three months of flying training on the De Havilland Tigermoth followed before Alfred was commissioned in the Indian Air Force on 31 January 1944 with service number IND/2824. He was just 26 at that time. This album has some rare documents from her collection - including her father's commission parchment, and a service discharge book - the first one we ever saw! A WW2 veteran of service on the Burma Front, Gp Capt CGI Philip was actually born in Burma, and had strong family connections to that country even before the War. Jagan interviewed him in April 2004 and in November 2005, while building Bharat-Rakshak's oral archive. Gp Capt Philip's words, we believe, convey a unique sense of those unique times. We have therefore retained his own words, for much of this article, which covers his early days in the Indian Air Force training on dive bombers and flying his first tour of operations with No.8 Squadron on the Vultee Vengeance. S NANDA KUMAR is transported back in time as he talks to 82 year-old Bangalorean, Neville Gill, now leading a quiet life after 53 years of flying. This article first appeared in Deccan Herald.